I have really enjoyed setting the table a few days earlier. It sets the tone, it sets the mood, it says something special is happening. That's one of the special hints that I learned from this group of girls. and a beautiful gold runner. Ellen is the Queen of table scapes. I can't begin to tell you how many Ikea open-storage units she had stocked full of dishes and decor. Today, I am going to do things a bit differently in my kitchen. It's a strong tradition to make pies for any Thanksgiving meal at our home. But I've realized that it's OK, if I want to change things up a bit. Way back in our recipes, there was a unique posting which needs high recommendations. In 2008, Betty posted a Peach Plum Galette. A galette is a free form rustic tart using pastry dough. It was this past summer, when I gave my youngest grandchild a freshly baked apple turnover. We've never heard the end of that story. a highlight for me as I planned our Thanksgiving meal. 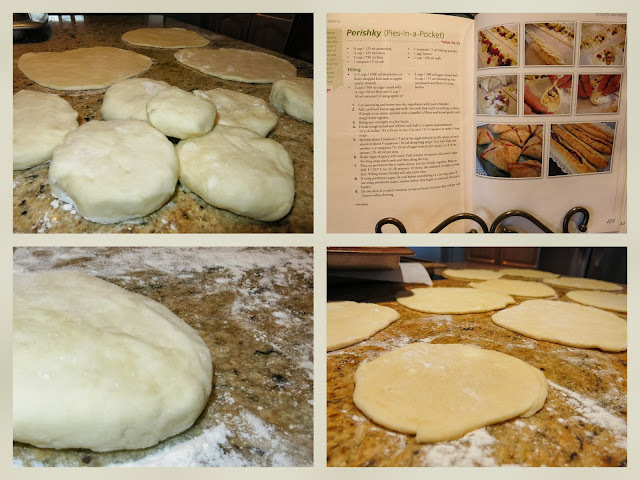 You can use any pie dough recipe, and I chose to use Anneliese's pie pastry from our first cookbook. Her recipe says to cool the dough, but I did not have time and it worked out perfectly. and then began to roll them out into about 9" circles. Do you notice a tiny puck on top? 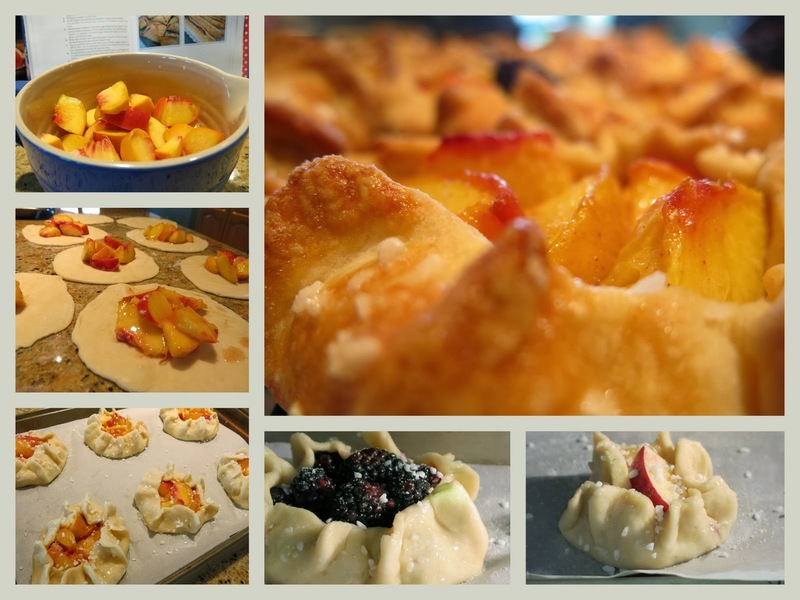 I followed her fruit recipe to a tee, and substituted nectarines, blackberries and apples. There's so many variations that you can make. I folded and pleated the dough just as she suggested and enjoyed the process. The Galette's are made and as I made each one...I gave thanks for each family member. And still there's one tiny apple galette...for who? I gave thanks for the unborn child that is expected in early February. I pray a blessing that you can all give thanks to our heavenly Father. and his faithfulness goes on and on to each succeeding generation." Your table looks wonderful and those Gallets look perfect! What a wonderful dessert for Thanksgiving. I love the wee one - such a sweet sentiment Marg! Have a most wonderful Thanksgiving my friend. That is just beautiful Marg. I love how this post just oozes with excitement. Lots of thought went into it and the galettes and table are an inspiration. Happy Thanksgiving to your beautiful family. Lovely post, Marg. Beautiful galettes :) To all Canadians, I wish you a very happy Thanksgiving. I love that idea of individual galettes! They look so mouth watering good! Wonderful post for Thanksgiving weekend, Marg! I didn't know we were eating all that good food today!!! When should I drop in??? You, know there is always plenty for You, Miss Bartel. Beautiful...the table, the galettes and the good news. Happy Thanksgiving to all those gathering around there this weekend! As an everyday reader and often, maker of your recipes, I want to wish all of you and Canadian readers a most happy Thanksgiving! You enrich my life with your ideas and faith and I am grateful to you. Oh ja der Herr ist gut zu uns. Alles ist wunderschön meine liebe.Bussi.Lu. You are such a gifted woman, Marg! I always love how your photos tell your stories so well. Happy Thanksgiving to you and yours! What a great idea. They look delicious. Happy Thanksgiving to you and your family, and a word of thanks from me for your wonderful recipes! Beautiful post Marg..you did an amazing job on those galettes! Beautiful, and the galettes look amazing, looking forward to making some! Happy thanksgiving!